Coreily lives with her guardian, Adalgisa, and Adalgisa’s three daughters and one cousin. When Coreily was 1 year old, Adalgisa asked if she could take care of her. At the time, Coreily was living with her mother in an unsafe environment. Since then, she has cared for Coreily as if she were her own and would like to officially declare her. 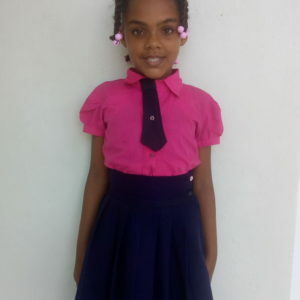 Coreily, at the moment, does not have a birth certificate, which means if she is not declared she will only be able to finish school through 8th grade. However, she is very active, loves going to church with Adalgisa, and enjoys playing with her friends at Emanuel House. Coreily has dreams of becoming a doctor when she is older. She enjoys writing, hola hoop, and jump rope. Her favorite color is now purple.